Searching for Bonobo in Congo » Kisangani, Can It Bring Law to Out-Law Lomami? Kisangani, Can It Bring Law to Out-Law Lomami? There is no question, our main message to the governor, the general, and all provincial authorities in Kisangani: COLONEL TOM MUST BE STOPPED. He is master of elephant poaching and dominates bushmeat trade. Colonel Tom himself told Ashley, with a wave of his hand, “the forest is mine”. In the east, bandits like Nkunda head armies of guerillas, are backed by bank accounts in Rwanda, combat ethnic rivals, and threaten the last populations of Congo’s gorillas. 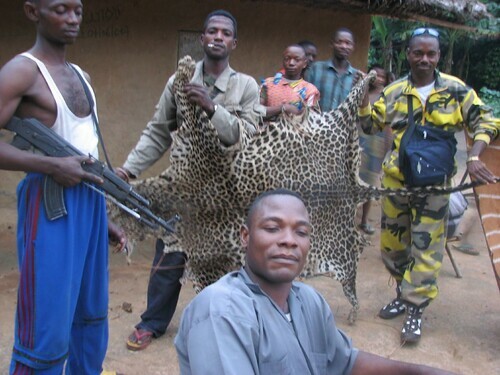 Dead center, bandits like Colonel Tom are on their own turf, terrorize neighbors, poach for ivory and turn wildlife to bushmeat in Congo’s unprotected forest core. Of the latter type of bandit, Colonel Tom is top of the wanted list. Barter for Bushmeat is the main currency of exchange south of Opala. Ashley came to Kisangani by dugout. He shot the last 270 kilometers down the Lomami from Opala and then pushed the last 120 km up the Congo to the same small port he left two and half months earlier. I flew Bravo airlines from Kinshasa to Kisangani. Incredible frontier town. In its backyard markets, Kisangani handles diamonds, bushmeat and any other natural resource pulled from the forest or dug from the earth. 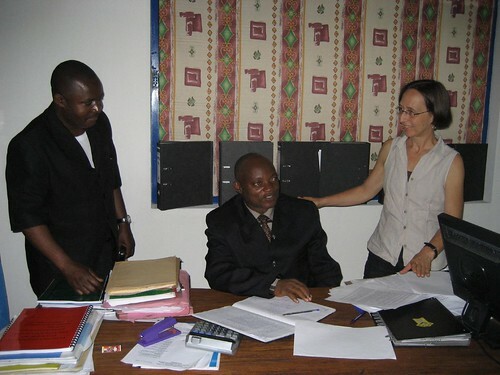 This is where Ashley and I conferred and this is where we worked with a first-rate collaborator, DP Malengani of Congo’s conservation institute (ICCN). Terese and Ashley. Happy to see each other again. Malingane described the new government. “Will we be heard “, we asked? The old general ,Malingane explained, was a Maimai during the rebellion, like Colonel Tom himself. “That General has just been ousted”, he told us. 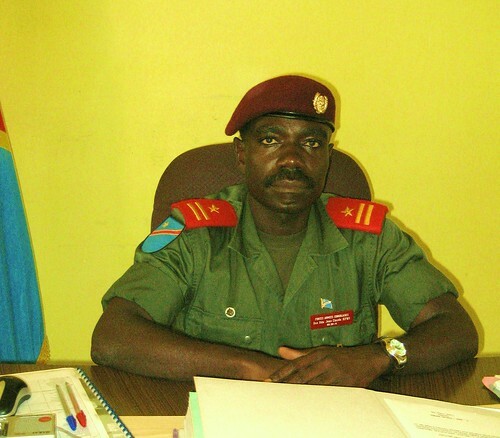 The new General, J-C KIFWA, must now control a third of the country. The General met us on our first full day in Kisangani. The new administration was equally committed. All are young: the new governor, vice-governor, the provincial environmental officer, the woman who is territorial administrator of Opala. This junior government takes authority over an enormous province where schools don’t function and hospitals are without medicine and doctors. They have heard us. What remains to be seen is action. Malingane remains in Kisangani. He will update us, and we will update this blog. Morgan is Dead! What follows for Congo’s Forests? This entry was written by Terese Hart, posted on 2007-09-05 at 9:10 pm, filed under Diamonds, gold and guns. Bookmark the permalink. Follow any comments here with the RSS feed for this post. Post a comment or leave a trackback: Trackback URL. Good update. I hope General Kifwa is successful in removing Colonel Tom. When he’s done there, think you can convince him to get rid of Laurent Nkunda? Sounds like perhaps progress may be on its way, let’s hope this new government is the right answer…good luck Terese and Ashley. And Sheryl, wouyldn’t it be nice if there were no more L. Nkunda and others like him! This is Terese. Actually the General Kifwa just sent troops several days ago to combat Laurent Nkunda…Ashley watched thousands march to the Kisangani airport. Still waiting to tell the success story though. Sigh. Terese — I have actaully had thoughts similar to Lisa’s…living in a country (US) where there is no predominant demand to hunt food in order to eat, it is hard sometimes to understand that there are people who need to hunt to survive. My question then, is where are the lines between the basic neccessities for the people of the Congo (food, heat (i.e. the charcoal production issue) and just downright inhumane actions? For example, it appears from these blogs that the act of killing seven gorillas in July was one of pure maliciousness, meant, at least partially, to send a message about inhibiting the charcoal trade. I am very interested in your thoughts about this. Terese again. Serious thoughts and not easy questions. The easiest to decry are the extremes. Gorillas are rarely now killed for reasons other than to make a political statement. Elephants are almost always killed for ivory and often the meat is left to rot where the animal falls. A little more difficult to characterize is commercial hunting but the difference between commercial hunting and subsistance hunting is an important one to make. Commercial hunting often includes huge numbers of animals acquired by one or several buyers who take them to resell elsewhere. When commercial hunting becomes the way of life of numerous people — wildlife is on its way out. When I am not feeling particularly optimistic I say that protected areas that are well protected is what is needed and then all of the rest of the forest will just have greatly reduced wildlife, and large animals will disappear from most areas. This is afterall more or less the situation in America. Two important differences: in most parks here there is NOT effective protection yet and the wildlife is far more diverse here than in the States with some large mammals that are found no where else (inlcuding bonobo and okapi). 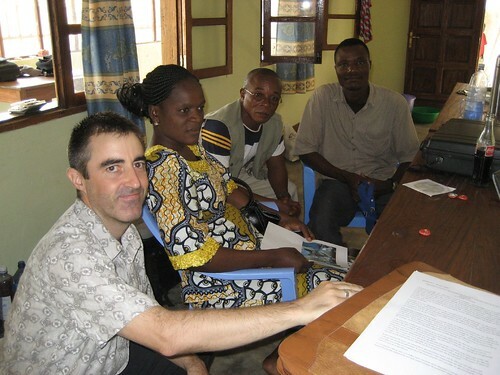 Just an added note: John and I brought our kids up mainly in Congo — in the Ituri Forest. When they were little bushmeat — mainly forest antelope — was our main staple. But as they grew older we watched a low population grow larger and hunting become more and more commercial. Our own habits began to seem in opposition to what we were working towards although our policy (buy only form pygmies what they hunting themselves) seemed fairly sound. Now when we return to the Ituri we mainly eat chicken and manioc greens ! Hey Lisa, I’m going to guess the leopard was killed for its pelt. In SE Asia the clouded leopard population is critically endangered – because of poaching. The cloudeds are killed for their beautiful pelts, their incredibly huge canines (the largest canines in relation to head size of any cat species), and their meat. It’s sold in upscale Asian restaurants to rich people. Because of these practices the Taiwanese subspecies is extinct. The pelts are sold on black markets in Thailand and Borneo for about $100. To you and me, that’s a damned cheap price for the extinction of a species, but for the average Thai worker that’s a year’s wages. Just my .02, your mileage may vary. Terese — thank you so much for your thoughful comments, Sheryl too. Conservation issues are so complex and challenging, made more so by the voltile nature of the politics of your region. It is nice to know that so many people are committed to change despite how difficult that change may be to effectuate…participating in this blog has made me think a lot about my own role in the world…Thank you so much for the inspiration you provide to many of us every day. Isn’t hunting based on needs and supply as in the indians needed buffalo to live and there were millions to kill but we have a “short/endangered supplies” and they do not NEED to eat these animals — to me that adds up to STOP HUNTING – YOU DON’T NEED IT TO LIVE AND THERE IS NO BIG SUPPLY — UNFORTUNATELY THAT LEAVES THE $ VALUE IN IT AND THAT IS THE ROOT OF ALL THE EVIL! 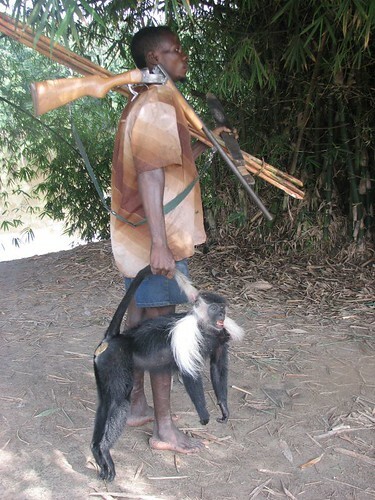 Terese: yes… it is the $$ value in city markets that pushes the bushmeat commerce. No question. how are you? i think not so good. thousands of eyes all over the world have seen you. and importantly the eyes of Kisangani are on him. Including the general and the top administration. We are all standby and you will be informed. Hey Lisa, No kidding. You would think the wealthy people eating the clouded leopards would be educated enough to realize they are contributing to their decline. Who is going to save the clouded leopards from their appetites?